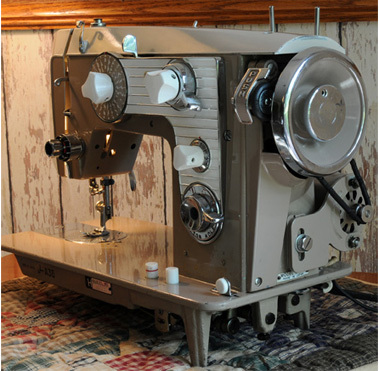 This is our Brewer sewing machine. We didn't get a manual with the machine and there has been a steep learning curve to determine the purpose of all its dials and levers. The rear of the Brewer shows an original motor. Also a nice feature of this machine is that the two spool pins can be easily rotated 180-degrees downward to protect them. the round item can be removed providing access to internal pattern cams. The motor appears to be worn out as there is excessive play in the bushing on the side that drives the belt. Occasionally a very unpleasant noise comes from the motor's bearing area. 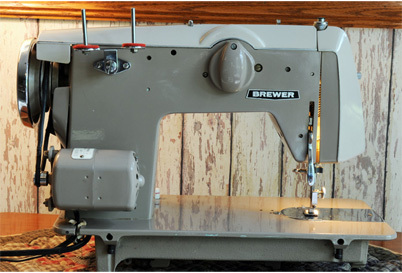 The Brewer has a vertical bobbin and bobbin case accessible through a slide plate. This machine probably was mounted in a cabinet originally and we don't have a carrying case for it. It uses a standard 15x1 needle. Without the manual, we are not exactly sure as to the proper operation of all the controls. The left-most large dial is a pattern selector. 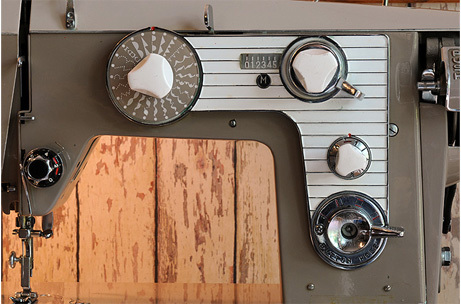 The top right knob controls zig-zag width while a lever on the same axis selects needle position right, middle, and left as seen in the small round window. 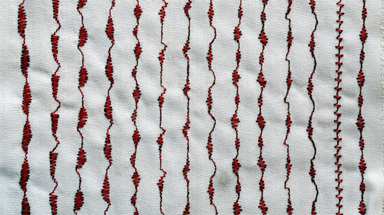 A smaller white knob controls stitch length. 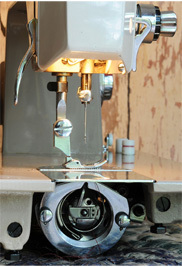 The lower knob is used to form button holes. Making a button hole is a 4-step process by rotating the dial to form each of the four sides of the buttonhole. 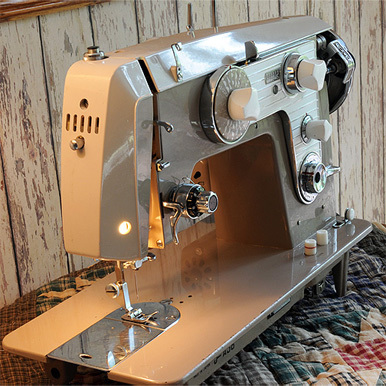 Missing on our machine is a button which can be depressed to control sewing in reverse. Above is a sampling of stitches made with the Brewer using its internal cams. This is not the complete list and each pattern here can be modified by positioning the stitch length and needle left/right position.